Boy, it's quite difficult to find an authentic mole in the GVRD. No, not the buggers who dig up your lawn. I'm talking about a Mexican mole which can be prepared with as much as 20+ ingredients that sometimes includes chocolate. Unfortunately, I haven't been to Mexico to actually try an authentic mole. I just have to go by what I eat and what Sexi Mexi had explained to me. The last time I had a mole was at La Conquistadora and it was alright. What I really wanted was a Oaxacan Mole, much like the one Rick Bayless incessantly reminds us how long it took him to master. 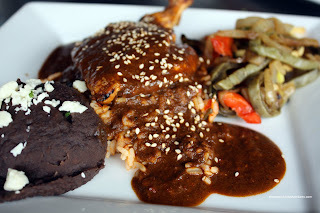 While perusing Urbanspoon, I noticed El Bar rio had the very Oaxacan Mole I was seeking. I was able to convince Pomegranate to join me for this meal. Partly because I needed a dining partner and more importantly, he spent some time in Central America (thus, some knowledge of the food). We started off with the Bison Tacos prepared medium rare. As you can see in the picture, they were indeed a perfect medium rare. Since Bison is quite lean, it is imperative not to overcook it. Otherwise, you'll be chewing for awhile. 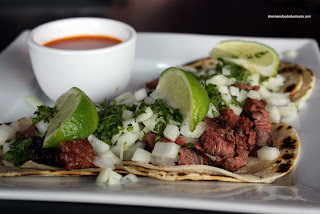 The soft tortillas were slightly charred giving a smoky quality to them. In this case, you'll either like it or not. For me, it adds flavour and I liked it. Served on the side was a Salsa Roja (or red sauce). Interestingly, people in North America associate "salsa" with everything that is like the stuff you find in a jar of El Paso. However, salsa merely means sauce. As for my Pollo En Mole (which is a free-range chicken breast smothered in an Oaxacan mole), it was served with refried beans and cactus. I have to admit that the chicken itself was dry. Not totally surprising since free-range chicken is quite lean. However, the sauce made up for it. The mole was quite mild with an underlying spice and nuttiness. Since there are so many ingredients in the mole, it was quite complex, if not very understated. 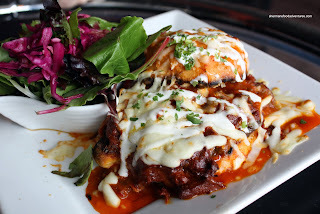 While my dish was mild, Pomegranate's Torta Ahogada was simply a flavour explosion. Savory, spicy and sweet all at the same time, this is described as a Mexican "sloppy Joe" in the menu. A pretty accurate description. However, the side salad was horrid, way too much dressing. From the 3 items we tried here, it showed us that El Barrio offers something a little bit different. In terms of liking it or not, that'll be up to personal tastes. Pomegranate and I were pretty satisfied; however, for some, the prices could be a bit high. How expensive was "quite pricey"? Yah, I think Kim told me that. I guess I just haven't been in the neighbourhood when it's been open. My chicken was $16 and the torta was $14. I consider that expensive. But who knows, some people might not think so. The prices aren't too bad. I was at wazubees and their buutermilk fried chicken was $17 and that was not a non-medicated chicken. Most entrees are now around $14-$25. I would call their prices average. They do make really good mole and chipotle. Glad you liked it! Since you approve, I think I'm gonna make a visit in a week or so... really craving for paella, I hope it's traditional and yum! 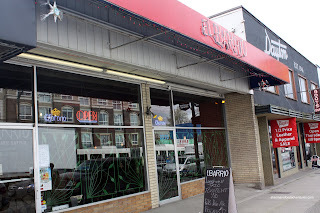 When you are paying for authentic, amazingly good food that El Barrio serves, mixed in with the awesome customer service and live music, I think it's totally worth every penny!